The 2016 Perseid Meteor Shower peaked on the morning of August 12th. I set out with a friend to Buffalo Park in Flagstaff, Arizona to capture the shower. We arrived around 10 PM, a time during which the moon was still a couple hours from setting. This allowed me to capture a well-lit foreground shot that I would use to layer all the brightest meteors that I captured through the night. Here is a look at the shot I used for the foreground, entirely unedited (Tamron 15-30mm lens: 15mm, 15 sec, f2.8, ISO 1600). Base image used for the final composite photo. This was taken prior to the moon setting in order to get the foreground well-lit. Since the moon would still be up for a couple of hours yet, we could only really see the brightest meteors. 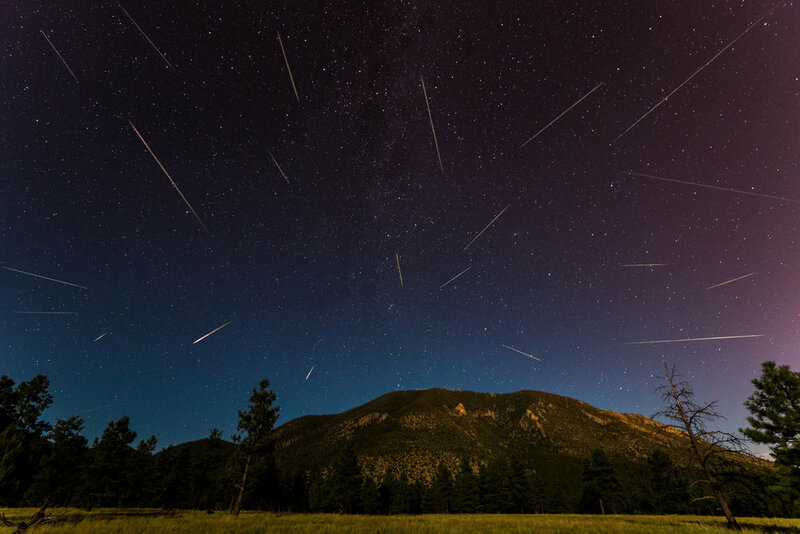 There was a window from around 11 PM to midnight where the Perseid Meteor Shower put on quite a show. Once the moon finally set around 12:30 AM, the number of meteors seemed to drop off pretty drastically. At 1 AM, we decided to call it a night since we both had to work early the next morning. In the end, I had captured around 24 photos with meteors in them out of nearly 500 shots over three hours. The next step was editing the base image so that it would be ready to add the additional meteors to the shot. Here is a look at what the edited base image looked like. This is what the edited base image looked like. It was now ready for me to add the additional meteors to this shot to create the composite shot I was going for. Applying those adjustments gave me the image you see above. The next step was to apply the same adjustments to all the other images that I wanted to use (not entirely necessary for how I made the final edit, but it doesn't hurt and takes two seconds). I then opened up all 20(ish) images as layers in Photoshop. My final composite image of the Perseid Meteor Shower with Mt. Elden in the foreground. So that's the basics of how I created the final composite image consisting of 22 different meteors taken over the span of three hours. If you have any questions, feel free to leave a comment or contact me via Facebook!